will receive the Georgia Dugout Club's Ethics in Coaching award. David Smart figured he would made a quick telephone call to Greg Frady, make a recommendation for the Ethics in Coaching award and move on to something else. Smart’s call didn’t go as planned. Frady, the Georgia State head baseball coach who chairs the Georgia Dugout Club’s Ethics in Coaching Committee, listened to Smart. Then he told him the two needed to talk. 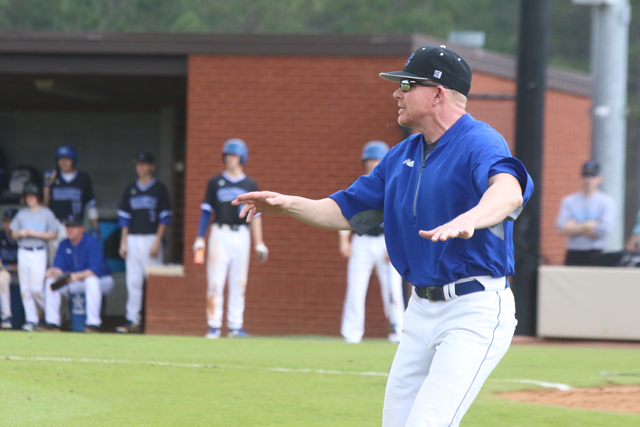 “He ended up telling me … I had no idea,” said Smart, who formerly was the head coach at Northside-Columbus and LaGrange High before taking over at Forsyth County’s newest school, Denmark High, earlier this summer. Before taking over at Northside in 2009, Smart was a top-notch assistant who worked under Tracy Powell at Hardaway for three seasons before working under legendary high school coach Bobby Howard for 10 seasons at Columbus High. Smart was part of three state titles at Columbus and Howard, who is the state’s all-time winningest coach, said his pupil helped him become a better coach. “David Smart models what coaches should act like on and off the field,” said Howard, now at Saint-Anne Pacelli School. After leaving Northside, Smart spent one season as an assistant at Brookstone School in Columbus where he worked under Vince Massey, who was the Ethics in Coaching recipient in 2016. Smart spent three seasons at LaGrange where he took the Grangers to the Georgia High School Association Class 4A state semifinals in 2017. He left after the 2018 season to start the varsity baseball program at Denmark. Frady said he found it weird that Smart was calling him to recommend another coach when the Denmark High coach represented everything the Ethics in Coaching Committee was looking for. “That’s the thing about David, he’s always thinking about somebody else,” Frady said. “He’s had the right people in his life who have shown him the blueprint and how to do it the right way. Right now, I see him as one of the top coaches in the state of Georgia. Smart will be presented with the award during the annual Georgia Dugout Club Coaches Clinic at the Marietta Hilton Conference Center on January 11, 2019. He will be honored during the awards ceremony along with the five newest members of the Georgia Dugout Club Hall of Fame.